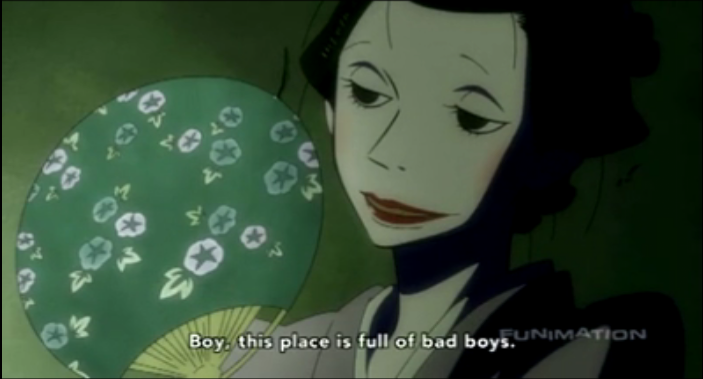 Otake likes the bad boys, almost as much as she likes her sake. 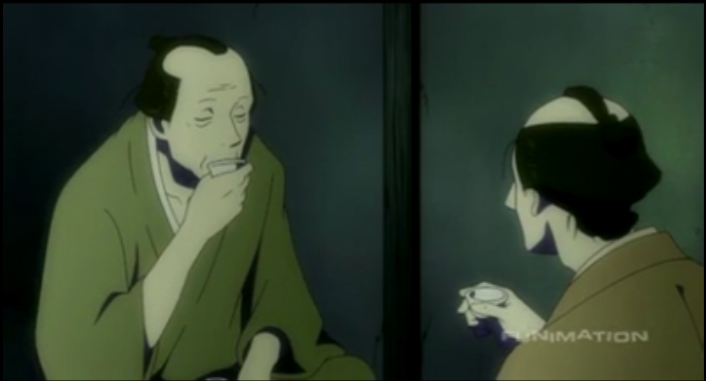 In House of Five Leaves episode 5, personal histories return to haunt several people, including Ume. The difficulties of attaining money are shown to be nothing when compared to the intractable problem of running away from your past. 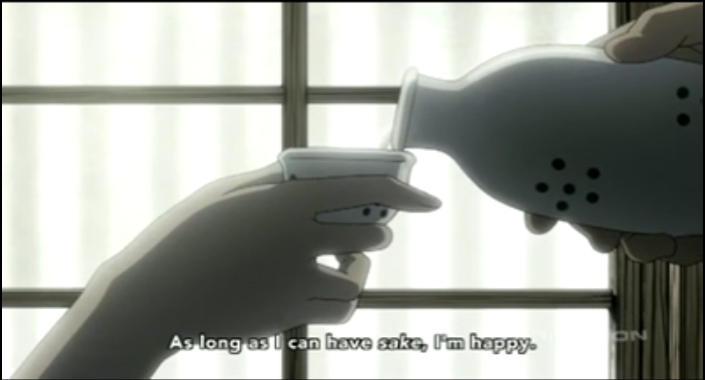 Also, sake is extolled as the one thing with which we can become involved that will leave us free from care or remorse. This was the first episode that picked up right where it left off, in the middle of the flashback to the first kidnapping. It turns out that first kidnapping was even more significant than previously realized. 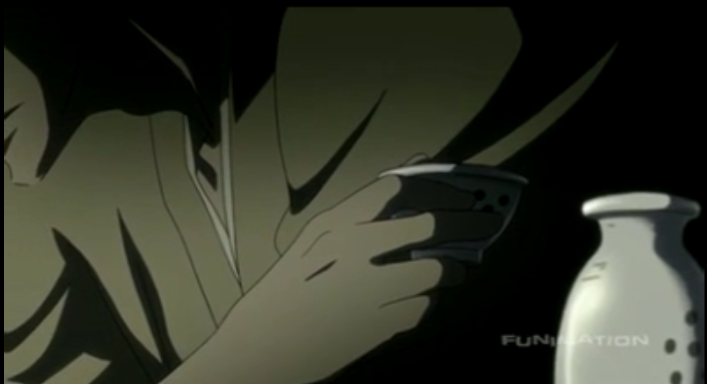 Ume is initially motivated solely by his desire for revenge on the man who tried to take advantage of his daughter, but by the end of the episode, it is clear that a darker cloud from his past hangs over his heart. The result is an admirably complex study of characters. Several characters are compared, and they form a spectrum of behavioral patterns. One, an old gang member who is being blackmailed, acts selfishly, but refuses to take responsibility for his actions; he attempts to blackmail his old boss, rather than pay the price for his past misdeeds. His old boss, the elder who has been hiding the kidnap victims, maintains a strict attitude of not getting involved in the affairs of others. He is also literally likened to a saint at least twice, so I think it is fair to say he puts the behavior of the other characters into a religious (Buddhist) context, that is, that suffering is inevitable as long as we remain attached to the phenomenal world (samsara), and that our past actions lead to unavoidable results (karma). 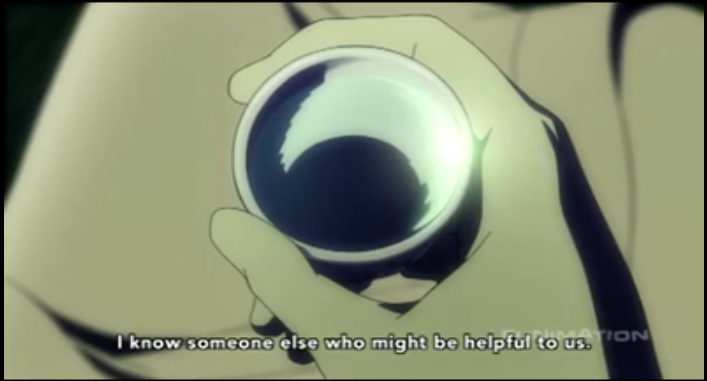 Not only does he demonstrate this with his actions, he also gives this advice to both Ume and Masa. 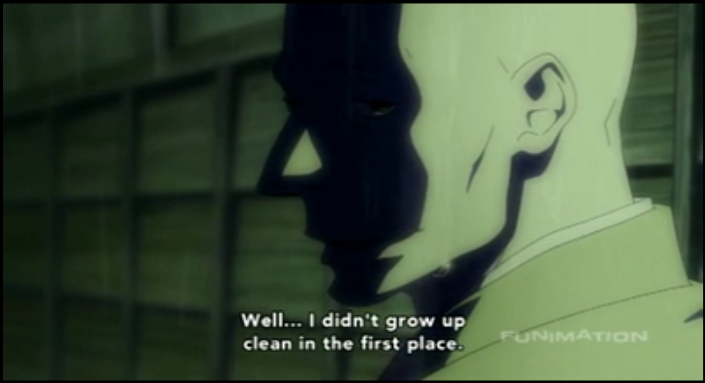 Finally Ume, takes responsibility and acts selflessly. Despite the warnings of the elder, he seems to feel guilt and compassion. 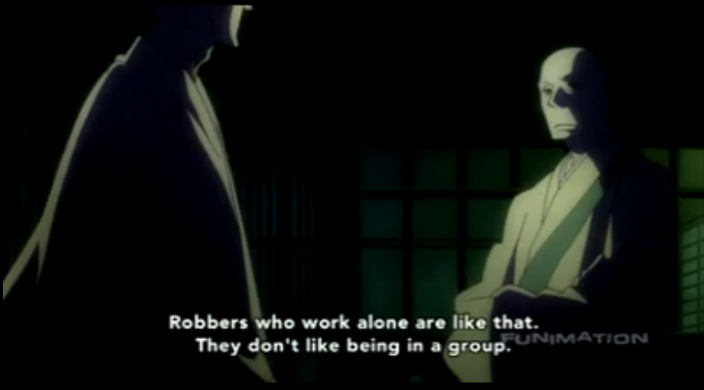 Ume’s desire to protect his daughter, by leaving the old gang, his desire to help the other robber’s family escape their fate, and his friendship with Masa, who like Ume would like to keep his hands clean, if there were a way to do that, all add up to a detailed portrait of the man. Yes, he wants money, but so that he can pay the blackmail, and thus protect the family, of a man he hardly knows. 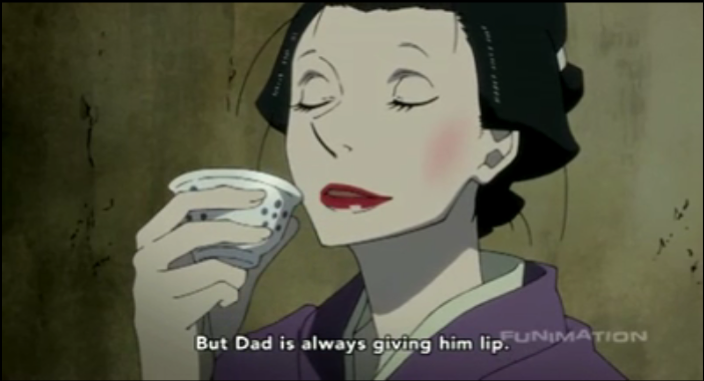 Yes, he likes Otake, as was obvious earlier, but now we hear clearly that she reminds him of his dead wife. Ume is a man who can see the people he loves in the lives of strangers, and he struggles to find a way to protect them. Although there is something beautiful and noble in this, it seems destined, as the elder might say, to suffering, something that the art direction of this series, with its extremely dark settings, and absence of color is really good at bringing out.